Since the Sacramento River opened in mid July it’s been extremely good. 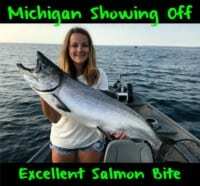 We are seeing lots of fish and although you might have to work hard to catch limits the salmon are much larger than they’ve been for many years. The fish are averaging in the mid twenties to the 30s. I’ve seen them around the Woodson Bridge area into the upper 30s. That’s not something we normally see until the fall. I’m surprised at how bright the fish are. They are coming through Sacramento so fast that they still have a lot of scales on when they come up here. I’ve never seen these fish in as good as shape as they are this far upriver. They are chrome. I think what’s happening is the water temperatures in the Sacramento area is in the mid seventies and the salmon are bolting up here to get in that 60 degree water. I’m fishing Woodson Bridge on downriver for about seven miles. For those of you not familiar with the area, I’m north of Chico and south of Red Bluff. What’s happening right now is the flows are up near 10,000 cfs and the fish aren’t holding in the same areas as they normally do. Those are high flows for this time of year and it’s forcing the salmon to travel. They are moving and not holding in the deep pocket water. You’ll see a lot of fish jumping. They are on the run right now. If you see them moving fire your boat up ahead of them to the next deep water hole. You aren’t anchoring. Instead sit there on idle and back-bounce or boondoggle downstream. You are looking for deeper holes right now; anywhere from 12-26 feet deep. I’m finding a solid plug bite really early in the morning. I’m running K-16 or Brad’s 16 in chrome and chartreuse. However, as soon as sun hits the water it turns to a roe bite. I’m using chunks of roe about the size of your thumbnail. All of my roe fish have come on red FireCure scented heavily with Fire Power (pure krill powder). These fish are krill eaters. Scenting the roe with the krill powder is important. 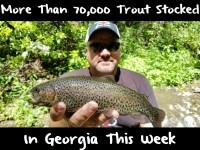 It seems in addition to a big push of salmon in the next few weeks there is more good news out there. We are hearing they are lowering the flow about 500 cfs a week, so in the next few weeks the fish are going to start holding up, which will make targeting them much easier. By the end of the month, as flows diminish even more, fish will be excellent. Editor’s Note: Pautzke pro Fred Thomason operates Last Cast Guide out of Woodson Bridge. For more info on his trips please visit www.lastcastguide.net. 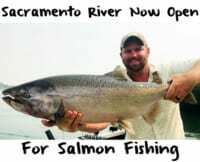 Anglers are permitted two Chinook per day on the Sacramento River this season.